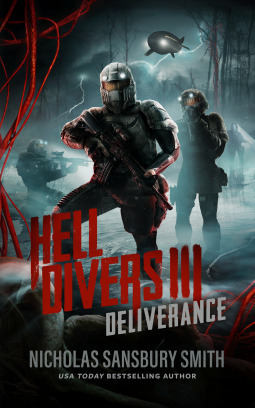 Thanks to the publisher and author for an advanced reading copy of Deliverance (Hell Divers #3) in exchange for an honest review. Receiving this ARC did not influence my thoughts or opinions on the novel. So, it has been a hot minute since I read Ghosts (Hell Divers #2), and I am not really sure why I waited so long to get to Deliverance. Smith packs a ton of punch into these books, which honestly makes them some of the quickest and most enjoyable reads in today’s post-apocalyptic/science fiction scene. While on the surface it seems to be a run-of-the-mill post-apoc story with mutant creatures and pow-pow, bang-bang shooty guys, Smith pushes the envelope with redeemable characters, political intrigue, non-stop action, and an ever expanding storyline. Just when I thought that the only threat to the survival of the Divers and people of the Hive were the Sirens, Smith brings in new and improved baddies to delight fans of immense creature horror. He has also created a few characters that you just love to hate, and I find that seemingly rare in books today. To just have a seething hatred for an antagonist and be ecstatic when they meet their fate. On top of all that, the alternate United States of American that Smith has created is an extremely enjoyable sandbox for his characters to play in. With cities known to the readers but unknown to all of those involved in the story, it is an interesting perspective on what we know and love. Overall, if you have been a fan of Smith’s over the years, there is plenty to love here in Deliverance. If you have yet to jump into his post-apocalyptic fiction, the series tends to be fairly cheap on Kindle and they are a very fun way to pass the time.